Our daughter coined these “Grizzly Bear Muffins” and I thought it was so cute that I had to go with it. I started out wanting to create a homemade version of these. 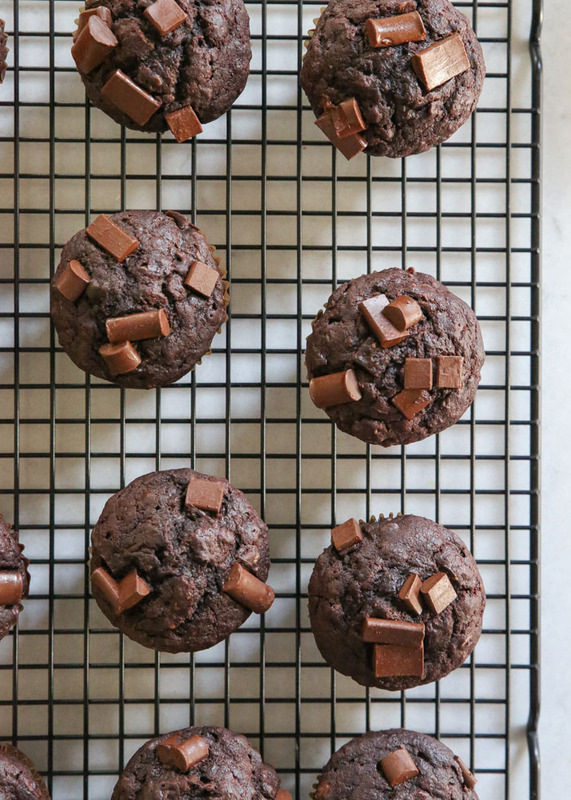 We call them “brownie muffins” and they’re a favorite around here. I love that it gets flaxseeds in all their healthy glory into my picky-eater of a kiddo. I ended up at this recipe from The Pastry Affair and, using that as a starting point, went from there. I’ll be honest, the end result is nothing like the store-bought Chocolate Brownie muffins that I was trying to replicate. These are more tender and cake-y – almost like cupcakes for breakfast (without the frosting) if I’m being honest. But they’ve become a family favorite just as they are, Bridget Jones-style, so I thought it was high time I shared them with y’all! Do you remember the Life Cereal commercial about Mikey? “He won’t eat it – he hates everything … HE LIKES IT! HEY MIKEY!” Quite honestly, our kid is a bit of a Mikey. An entirely lovable Mikey but a Mikey nonetheless. 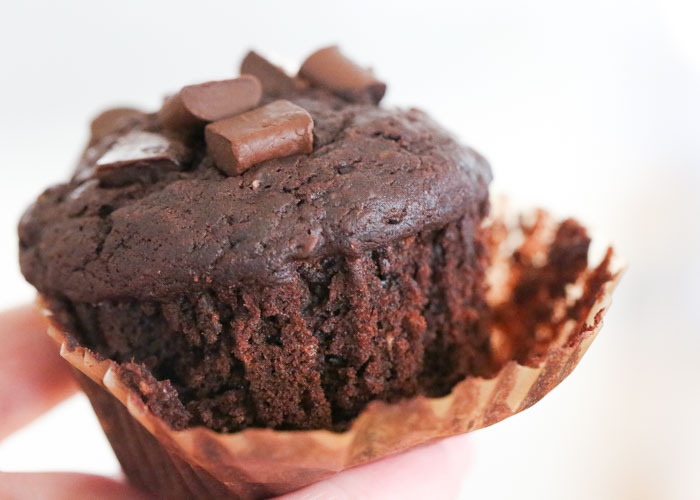 And she LOVES these tender chocolate oat muffins. Which means, I think, there is likely not anyone in the whole wide world who won’t like them. I guess they’re sort of grizzly-bear-esque with their rich brown color and the humps on their back? I don’t know, it’s a stretch. But regardless of what you call them, I think you’ll love them! 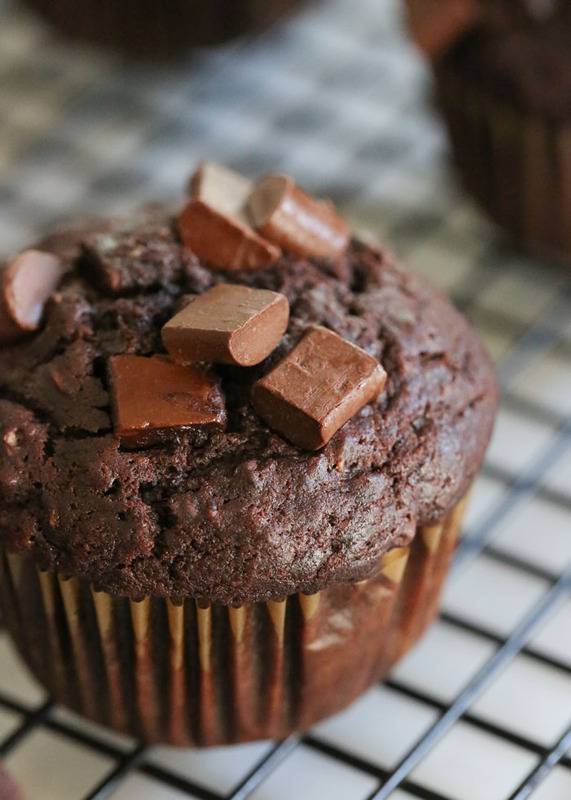 Moist, tender, and chocolatey, these easy muffins are the perfect breakfast treat. And nobody will guess they’re vegan (really)! Preheat oven to 375 degrees Fahrenheit. Grease the tins of a standard-size 12-cup muffin tin with your favorite oil mister, non-stick spray, or rub each cup with a bit of oil. Or the the lazy route, like me, and just use paper liners! In a medium bowl, mix together the ground flaxseed and the water. Set aside and let sit for 5 minutes to gel. 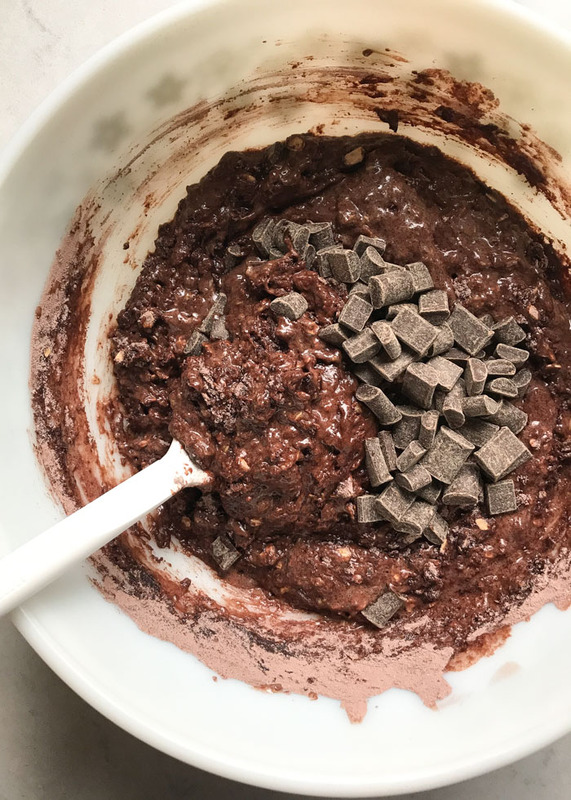 In a large bowl, stir together the flour, oats, sugar, cocoa powder, baking powder, baking soda, and salt. Add the almond milk, oil, and vanilla extract to the medium bowl with the flax. Stir to combine. Pour the wet ingredients over the dry ingredients. Stir just until combined. Fold in 1/2 cup of the chocolate chunks or chips. Divide batter between the 12 muffin cups. Top each with the remaining 1/3 cup chocolate chunks. Bake until the tops spring back when you poke them gently and/or when a toothpick inserted into the center comes out dry, about 20 minutes. Remove from oven and let cool for about 10 minutes, then transfer each muffin to a wire rack to cool completely. Muffins will be tender to start with but less tender once they cool. 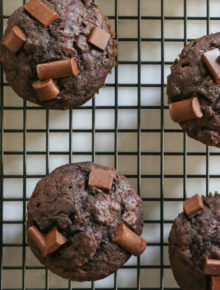 To keep these vegan, be sure to use dairy-free chocolate chunks or chips. My favorite is Enjoy Life brand.